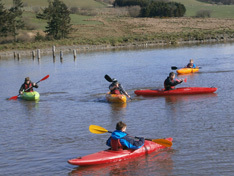 The First Arundel (Earl of Arundel's Scout Group) was formed in 1908, within weeks of Scouting being started. Now over a 100 years later it is still going strong providing girls and boys aged 6 to 25 a balanced progressive programme of activities that develops their potential and helps by giving them skills to make them better citizens in for the future. The Group has 3 main sections. We are also linked with the Peregrine Explorers Unit. The Group meets in its Headquarters in Green Lane Close, Arundel, which is available to hire and is suitable for use as a location for Nights Away activities. Call 0845 269 1908 for Hall Hire only. 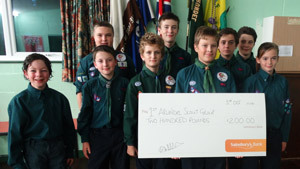 1st Arundel Scouts received a cheque presentation for £200 from Christine Gillott who works at Sainsbury's Lyons Farm. Christine volunteers throughout the year as the Arundel 10k run secretary, and Sainsbury's Local Hero scheme have donated to support Christine in her volunteering efforts. We have lots of information relating to our group history including photos and press articles. If you have any items you could share with us please contact us and we will copy and return your material.